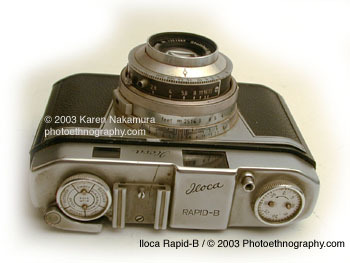 The Iloca Rapid B is yet another German consumer rangefinder of the 1950s. It was produced in 1954 but McKeowns doesn't give an end date, so maybe it was just made one year? The Iloca comes with a simple Steinheil München Cassar S 50mm f/2.8 lens; Prontor SVS leaf shutter; and a coupled rangefinder. All in all not a very impressive camera. Sears also sold it as their Sears Tower 51 model. You might want to compare the Iloca against the Leidolf Lordox camera, which was made in roughly the same period and same price point. I bought this camera out of the estate of Marion Carpenter, who was the first female White House photographer. The strangest thing about this camera is that the wind lever is on the left hand side. OK, so that's not that odd, Retinas have them on the bottom so the left hand side isn't too weird. But on most cameras that have the wind lever on the left side, the film is put in "upside down," that is the film canister goes on the right and is wound towards the left, the reverse of most modern cameras. But on the Rapid M, the film is wound to the right even though the wind lever is to the left. This is utterly backwards and doesn't make sense from a mechanical standpoint. I can only imagine they were trying to get around some patent or another. Rewinding the film and removing the camera back on this camera is extremly non-intuitive. On the bottom of the camera should be a "Made in Germany" sticker. Push hard on this, it's actually a release button for the rewind mechanism. Removing the back is quite a feat. The back snaps on, there is no official release mechanism. Just yank on the right hand side of the back. To snap it back together, insert the right side first then snap in the left side (totally counter-intuitive). I just bought a Tower 51 camera that is essentially the same as the Iloca Rapid that you review on your website. Can't say that I have looked at your site, I just "Googled" the Tower 51. Read your review, and you mentioned that "removing the back is quite a feat", actually it is quite easy you just lift up the rewind knob, turn it, and the back pops off. I must say that it is one of the most unusual designs as far as advancing and rewinding film is concerned, however I find the general workmanship to be quite high. The one I picked up was almost mint, and 100% functional. I was surprised the shutter was in such good shape. The viewfinder is none too clear, however the rangefinder works perfectly. Have some film in it now and am quite looking forward to what the lens can do, it is a Tessar style lens, and they always perform well. Just thought I would tell you about how the back opens. Iloca Camera was yet another post-War German camera manufacturing company.They were founded in 1948 and lasted until about 1960, when Agfa took them over. 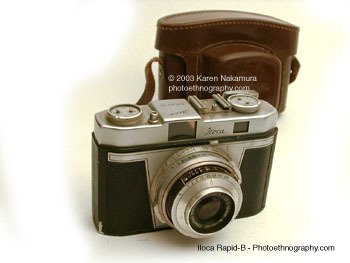 Some of Agfa's later 35mm cameras show the Iloca design influence. Last modified: Friday, 07-Jan-2011 15:21:50 EST , [an error occurred while processing this directive] .